The injured girl lay on the floor, another student holding her hand. 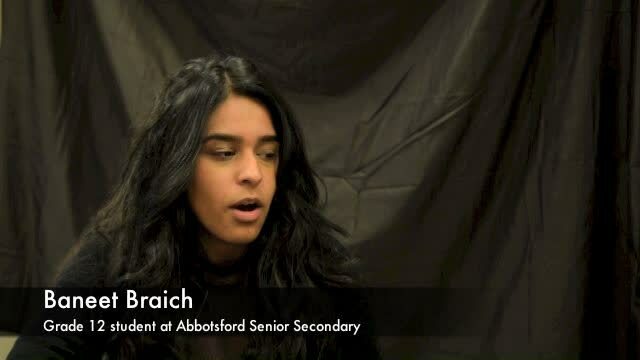 Student Baneet Braich was in the computer lab at Abbotsford Senior Secondary when she heard the screams. At first, she thought it might have been a belated Halloween prank, but then a girl who was covered in blood came into the room. “Help me! I’ve been stabbed!” the girl yelled. It took a few seconds for Baneet – a Grade 12 student whose English class was typing and printing out essays – to process what she was seeing. Was the girl ill? Was she joking? The teacher and two boys in the class who knew first aid rushed to the girl’s side, helping her down to the floor and keeping her calm. One of Baneet’s friends took the teen’s hand, and spoke words of encouragement and support. Lockdown alarms had sounded, and the students knew immediately what to do, having practised the procedures many times during school drills. They shut the blinds, closed and locked all the doors, and took shelter under the desks, while others continued to administer first aid to the injured girl. Baneet and her fellow students assisted where they could. They removed their shirts and sweaters to place over her wounds, and used pads to soak up her blood. Paramedics arrived within a few minutes while Baneet’s class was moved to another room. The students remained under lockdown for almost three hours, with no word on what had happened or why, and, because of spotty cellphone service, no way to access information. Baneet’s class was unaware that another female student had also been stabbed, but they would soon learn the details. The 14-year-old girl who had sought help from Baneet’s class (and who can’t be named because of a publication ban) had been doing homework in the school rotunda with her friend, Letisha Reimer, 13, when they were brutally attacked by a man with a knife. Both girls were airlifted to hospital. Letisha did not survive. Baneet and her fellow students were numb. They couldn’t believe that something like this – the type of situation you hear about happening elsewhere – had taken place at their school. Baneet’s friend had passed the two girls in the rotunda and smiled at them just minutes before the attack took place. Two teachers who knew first aid rushed to Letisha’s side. A couple of others, including the vice-principal, restrained the suspect until police arrived and took him into custody. More details emerged over the next 24 hours. Police revealed that the attack appeared to be a random act of violence with no known motive. The suspect – Gabriel Brandon Klein, 21 – was taken from the scene to hospital and released the following day (Wednesday) into police custody, where he remains. He has been charged with second-degree murder and aggravated assault. The matter is now in the hands of the Integrated Homicide Investigation Team (IHIT), which said Klein has no connection to the victims or to the school. They said he has no fixed address and is originally from Alberta but has been frequenting the Vancouver area since February or March of this year. She said police hope more information about Klein comes forward from the public to help aid in the investigation, although she said the motive for the attack might not ever become apparent. Baneet said the incident is not something she or her fellow students will forget, not only because of the horrific and sad circumstances, but because of how they banded together to save a life. “The event has been tragic … but it’s also developed a connection with my peers more, just to see what we were able to do. “I’m just very thankful to have the people that I have in my life. I’m just so proud of everyone,” she said. Baneet said their prayers go out to the friends and family members of the victims. Anyone with information about Klein or other details is asked to contact the IHIT tip line at 1-877-551-4448 or Crime Stoppers at 1-800-222-8477. Abbotsford Senior Secondary has been closed since the attack, but will re-open on Monday. The gym at St. Ann’s Roman Catholic Church (33333 Mayfair Ave.) has been open for student and family members to access support and information. The school district’s critical response team, including counsellors, will continue to offer support over the coming days and weeks.